My approach to training is based on positive and humane methods and follows holistic principles. 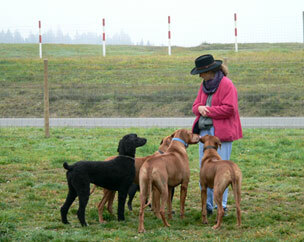 Such training is enjoyable and stress-free for dog and owner alike and works for all breeds. It creates a dog which willingly participates, thinks along, has good self-confidence and therefore will be a joy to live with. Several aspects of my training style make it positive. Appropriate and desirable behaviours are taught, solicited and rewarded. The dog is set up for success and so is the owner. While it takes time for new behaviours to solidify, creative management ensures that the dog does not practise the old and undesirable behaviours anymore. In comparison, traditional, correction-based training focuses on the dog making mistakes and suppressing behaviour by threat, punishment and pain. Old-fashioned methods are often questionable because of their many unwanted side-effects and often inhumane character. With several simple and highly effective reward-based methods there is no need to use a force-based approach! I can show you how to use positive reinforcement and how to employ your dog’s fabulous talent to problem solve to your advantage. By following learning theory and establishing patterns by which dogs learn best, you and your dog will progress quickly. I measure humane training by today’s standards of treating animals well. This includes avoidance of pain, stress or other discomforts for our pet dogs while satisfying their biological needs (physical, behavioural and emotional). My approach assumes that the responsibility for the well-being of our pets lies squarely with us, the owners. Non-confrontational leadership is an ideal way to carry out this responsibility and it also promotes a relationship of trust, cooperation and acceptance. We will be at our best and so will our dogs! 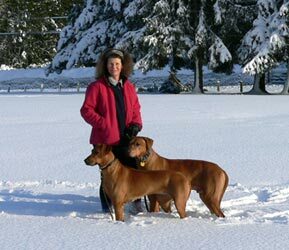 Like many trainers I found my way into dog training by owning a challenging dog: About nine years ago, we bought a 7 week old Rhodesian Ridgeback puppy. He proved to be very dominant and it became quickly evident that we needed professional guidance in dealing him. With advice from training books, a trainer and a well-meaning veterinarian we embarked on his training which included daily alpha rolls. For the next 5 months, we faithfully wrestled a growling and snapping dog to the ground, only to find out that he would outgrow our strength. Much other advice from training books did not seem to apply either: He did not follow their basic premise of wanting to please us nor was he ready to give in when forced! While positive reinforcement worked well for his obedience training, it did not address questions of challenges and leadership. I soon began searching for effective methods that were not based on confrontation or force and became deeply fascinated with the world of dogs. After successfully training our puppy I took a course with a well-respected local trainer to work towards becoming a professional trainer. Once she declared me fit “to teach others” I began volunteering at the local shelter. This gave me a great variety of training experiences with dogs and people: Soon, I began teaching other volunteers the training of shelter dogs and based on those experiences, I designed a Volunteer Shelter Dog Training Program. I have been presenting, teaching and overseeing this program for over 5 years at the local SPCA. Furthermore, my involvement with an animal shelter has provided me with many experiences of training and rehabilitating challenging dogs. A variety of dogs in need have been taken into our home and trained by myself, my partner and our two Ridgeback ‘nannies’. Early on in my search for professional education, I became a member of the CAPPDT (Canadian Association of Professional Pet Dog Trainers) and discovered their yearly national conferences. Participation opened up my horizon to the many fabulous dog trainers in North America who base their work on positive methods. Learning from their often pioneering work has become an integral part of my professional development. I have been greatly inspired by taking courses and observing the work of many fabulous trainers; including P. Reid, P. King, P. McConnell, D. Duford, I. Dunbar, S. White, G. Wilkes, J. Donaldson, B. Aloff, S. Clothier, P. Silvani, C. Smith, R. Abrantes, S. Sternberg. I would like to acknowledge my debt to them and the many more I have learned from. With the additional benefit of my background in social work I soon began offering training to private clients and their dogs. Today, my training services include all aspects of pet dog behaviour, including aggression to other dogs or people. My services are available in a one-on-one or class format. 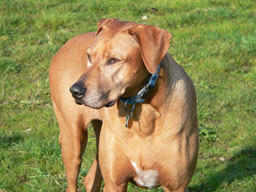 I am helped by my skilled assistant Judy Patchett and my wonderful female Ridgeback Danna. Don’t wait - start today!